On June 11, 1942, 2nd Lt. William K. Liggett was piloting a P-40E aircraft (Ser. No. 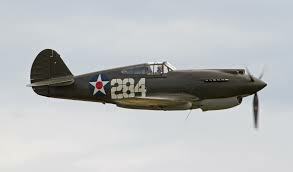 41-25019) as part of a formation training flight with other P-40 aircraft over the Narragansett Bay area. At about 1:45 p.m. his aircraft developed engine trouble and he was forced to look for a place to set down. He chose what he thought to be an open area of beach about one mile northeast of the town of Portsmouth, but as he got closer he realized there were civilians on the beach. Witnesses later told investigators that at the last moment Lt. Liggett abruptly turned towards the water and was killed when the plane crashed into the bay. The crash was blamed on a problem with the aircraft’s fuel system. Lt. Liggett obtained his pilot’s rating on April 29, 1942, and at the time of his death he was assigned to the 66th Fighter Squadron based at Hillsgrove Army Air Field, In Warwick, Rhode Island. On June 16, 1942, 2nd Lt. Herbert C. Chamberlain was piloting a Curtiss P-40E (Ser. No. 41-25161) over Norwood, Mass., when the aircraft experienced engine trouble. Lt. Chamberlain attempted an emergency landing at Norwood Airport, but went down in a swampy area near the edge of the field. The plane was damaged by Lt. Chamberlain was unhurt. Lt. Chamberlain was killed a few days later in another P-40 crash at Hillsgrove Air Field in Warwick, Rhode Island, on June 24, 1942. For more information, see that posting on this website under “Rhode Island Aviation Accidents”. At 4:30 p.m., on May 25, 1942, 2nd Lt. Thomas J. Beasley had just taken off from Bradley Field in a P-40E, (Ser. No. 40-392), when he discovered a problem with the aircraft’s oil pressure system and attempted to return to base for an emergency landing. After receiving instructions from Bradley tower, he was attempting to land when he suddenly saw another aircraft making for the same runway. At that time he made a skidding turn to the left in attempt to get into the wind, but his left wing dropped in a stall. Lt. Beasley was able to regain control of the plane, but due to his now diminished air speed the aircraft dropped flat onto the runway from an altitude of 30 feet and proceeded to skid for 75 yards before coming to rest and catching fire. Although the aircraft was a total loss, Lt Beasley escaped with minor injuries. The aircraft was assigned to the 66th Fighter Squadron, 57th Fighter Group.